I had the pleasure to spend the morning yesterday with Boise fly fishing guide Andrew Catt. When you want to relax and get away from it, nothing better than catching some Browns on the Owyhee River. Having fun and catching fish, what a way to spend a day. At Dreams on the Fly, our passion is connecting people with the outdoors through fly fishing. We provide every client with a top notch experience whether you are heading to the river for the first time or an experienced angler. We will match you with a professional guide and guarantee a safe and fun day on the river. The Owyhee river is the perhaps the finest brown trout fishery in North America. Enjoy the rugged beauty of this Eastern Oregon tailwater for it’s consistant 18-20″ brown trout. Just 1 hour from Boise, Idaho, over the border into Oregon, the Owyhee is a magnificent tailwater known for it’s plethora of insect life. The Owyhee is a walk and wade river with a slow gradient, perfect for all anglers to tease up some of the most finicky brown trout.  Dreams on the Fly has been professionally guiding the Owyhee river for fly fishing since 2001. 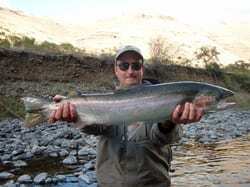 We know the fish, often by name, as we’ve been fishing the Owyhee for over 40 years! We are licensed, insured and permitted with the BLM, Oregon State Marine Board and hold CPR and Back county Rescue credentials! Test your fly fishing skills as you cast your line to an energetic steelhead among beautiful scenic wildlife in the land of “Winding Waters” on the Grande Ronde, in Oregon. Spey cast or single hand, we have the experience it takes to put you on the fish. Dreams on the Fly has been guiding the Grande Ronde for over 20 years, and offers Fall fishing (Oct-Nov) or Spring fishing (Feb-Mar). We offer 3 days float & camp trips in the Fall and single day fishing and floating in the Spring. Our trips are all inclusive except waders and licensing. You just need to bring your hearty appetites for both excellent fishing and awesome culinary delights! Experience the thrill of topwater fly fishing for smallmouth bass on an Owyhee on a 5 day wilderness float trip down the Owyhee. The NY times calls the Owyhee the “Grand Canyon of Oregon”. This 5 day float is not for the faint hearted, the Owyhee float above the Owyhee Reservoir is rugged country with no cell service, no roads, no people. Launching from Rome, Oregon this wilderness trip takes you into some of the most beautiful landscapes in Eastern Oregon and even the Western US. 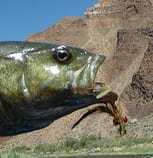 To top it off,, “A bass every cast” is not unheard of. New for the 2015 season we are introducing a scenic float trip on the Upper Owyhee River. The Owyhee River from Rome, Oregon to Birch Creek, Oregon is a 3 day float trip. There is a small window for floating the river due to the water levels. This trip is perfect for those who want to get away from it all! There are no roads for almost 49 miles. There is no cell service, no Internet connection…no people! Normally, our guided adventures are geared toward fly fishing. This particular adventure is geared toward floating, camping, photography and relaxation. Guests are welcome to fish; although they will be responsible for their own fishing gear and tackle. Let us float you down the river, take care of the meals, and set up camp. You can sit back, relax, and enjoy. A New York Times article in 2008 calls the Owyhee “The Grand Canyon of Oregon.” Floating along the Owyhee River in Oregon, you will pass through astonishing high desert canyon lands with thousand foot rhyolite cliffs and sand castle rock formations. Visitors will marvel at the variety of birds and mammals, including river otters, bighorn sheep and golden eagles. This trip is a photographers dream!